Kuwaiti delegates Khalidah Al-Dalama (left) with Sameera Al-Houli at the IUPAC Council (Beijing, Aug 2005). Al-Dalama is a National Representative on COCI. Last spring, COCI campaigned for the CA program and challenged its members to raise at least two new CAs. Khalidah Al-Dalama <kcs@kma.org.kw>, from the Kuwait Chemical Society (KSC) and National Representative on COCI, lost no time actively recruiting in her region. Founded in 1982, the KCS has prominent activities on both the local and international levels. On the local level, it embraces, sponsors, and organizes meetings, workshops, and lectures in Kuwait in many fields that might be of interest to chemists, and other professionals, in cooperation with other public-serving societies and governmental or private sectors. It also sponsors other social activities that are enjoyed by its members. On the international level, delegations and representatives of the society have been attending major conferences and meetings, dealing with chemistry and chemical issues, that are organized or held by several international bodies in which the society is an active member. 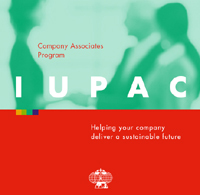 For more information about the CA program or additional copies of the brochure, please contact the IUPAC Secretariat by e-mail <secretariat@iupac.org>. Page last modified 28 October 2005.